Drusy, often spelled "Druzy" is a layer or crust of tiny crystals on the surface of a rock. Most often it is found in a crevice or on the inside surface of a geode. I suppose it could be any kind of crystal, but usually it is referring to quartz crystal. Drusy has become very popular in recent years as a cut, jewelry stone. A section of the drusy bearing host rock is cut out and shaped, usually with a flat back, similar to the way a cabochon is made. The drusy crystals on top are left intact. In the example on the left, the host rock around the edges has been polished. Sometimes the Drusy goes right up to the edges. The drusy is sometimes clear quartz and sometimes amethyst or citine. Most often though, the crystals have been treated in some way to change or enhance the color. 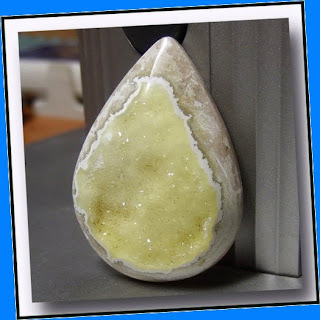 The majority of druzy is naturally a dull grey color. One common technique coats the crystal with another metallic element such as titanium or cobalt to give the drusy a really sensational look! 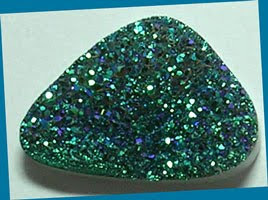 The picture below is a titanium coated druzy. This permanent treatment is done in a vacuum chamber and can be very difficult to do properly. 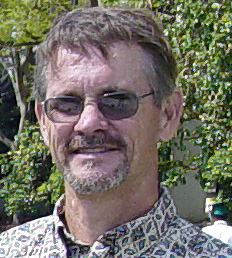 Other times the material is dyed or is otherwise diffused with color. The finished stones can be set in jewelry with a bezel or prongs. They also make great wire wrapping subjects. Drusy gemstones make great jewelry stones . They are usually quite durable and definitely are real attention grabbers.